At the invitation of Han Zheng, member of the Standing Committee of the Political Bureau of the Central Committee of the Communist Party of China and Vice Premier of the State Council, Sheikh Nasser Sabah Al-Ahmad Al-Sabah, the Special Envoy of the Emir, First Deputy Prime Minister and Minister of Defense of the State of Kuwait will visit China from December 15 to 20. At the invitation of Foreign Minister Saleumxay Kommasith of the Lao People's Democratic Republic, State Councilor and Foreign Minister Wang Yi will pay an official visit to the Laos and attend and co-chair the fourth Lancang-Mekong Cooperation (LMC) Foreign Ministers' Meeting from December 16 to 17. At the invitation of Indian External Affairs Minister Sushma Swaraj, State Councilor and Foreign Minister Wang Yi will visit India and co-chair the first meeting of China-India High-level People-to-People and Cultural Exchanges Mechanism with Minister Sushma Swaraj from December 21 to 24. Q: China and Japan have agreed to hold the tenth round of High-level Consultation on Maritime Affairs within this year. Do you have the specific date, location and topics for the consultation? A: China and Japan have agreed to hold the tenth round of High-level Consultation on Maritime Affairs in Wuzhen, Zhejiang Province of China from December 17 to 18. Officials from the diplomatic, defense, maritime law enforcement and marine management departments will participate in the consultation. The China-Japan High-level Consultation on Maritime Affairs is a comprehensive mechanism for the two sides to communicate and coordinate on maritime affairs. China is looking forward to a full exchange of views with the Japanese side on maritime issues of common concern in this round of Consultation to enhance mutual understanding and mutual trust. We will release more details regarding this round of Consultation in a timely manner. Q: US National Security Adviser John Bolton yesterday gave a very strongly-worded speech about Africa which he basically accused China and Russia of corrupt business practices in Africa. What is the Chinese government's response to his speech? A: We have noted the relevant remarks made by the US side. Supporting Africa's peace and development is a common responsibility shared by the international community. For us, we always approach the international community's cooperation with Africa with an open attitude. We welcome greater inputs from all members of the international community to support Africa's development on the basis of respecting Africa. Meanwhile, we maintain that such cooperation shall fully respect Africa's wishes, meet Africa's needs, refrain from interfering in Africa's domestic affairs, and add no political strings. When we Chinese people talk about cooperation with Africa, we highlight what African countries need, like industrialization and agricultural modernization. But let's take a look at the Africa speech made by the relevant person on the US side. Besides talking about its own interests and needs, it has not Africa, but China and Russia, on its mind. Isn't that interesting! Who is making efforts for the benefits of African countries and who is working with hidden motives? The public has no problem being a fair judge for that. Here I'd like to offer you some points on how African countries think of China-Africa cooperation. During the September FOCAC Beijing Summit and the 73rd General Assembly, leaders of many African countries explicitly expressed their dire need for development, capital and cooperation. They pointed out that support and assistance from China have come with no political strings attached and do not interfere in their countries' domestic affairs. They expressed their welcome and appreciation for China, praising China as the most reliable partner for Africa's development. President Geingob of Namibia talked about the annoying concerns some countries have over China's so-called influence over his country. He said that no one shall underestimate the intelligence of the African people who knows how to handle their own affairs. Leaders of Zambia, Burundi, Côte d'Ivoire said on various occasions that Africa had long been colonized and such colonization was only followed by economic exploitation. Western countries feel anxious now because they see no opportunities of doing these things, so they start to focus their aim on China. China has never colonized Africa, and China's cooperative efforts in Africa are meant to achieve the lofty goal of enhancing the benefits of people on the two sides. They said that they know the West wants them to keep distance from China, but they can make their own judgement which is that China is a true friend and the most important cooperation partner for Africa. Finally, I want to reiterate that regardless of what other people might say, China will continue to observe the principle of sincerity, real results, affinity and good faith and uphold justice while pursuing shared benefits. We will strengthen our friendly and mutually beneficial cooperation with African countries and in particular seek greater synergy to earnestly implement the outcomes of the 2018 FOCAC Beijing Summit and the consensus reached between Chinese and African leaders and further advance China-Africa Comprehensive Strategic Partnership for Cooperation. Q: The US Congress has voted to demand access for US diplomats, journalists and tourists to Tibet. If these people do not get access to Tibet, the US Congress wants to deny the access of Chinese officials to the US. What is your reaction to that? A: The relevant bill passed by the US Congress has disregarded the facts, grossly interfered in China's domestic affairs, and violated the basic norms of international relations. China is resolutely opposed to this and has made stern representations to the US. Tibet affairs are purely China's domestic affairs and allow no interference from other countries. If a foreigner wants access to Tibet, he/she can go through normal channels to realize that. In fact, every year, a large number of Chinese and foreigners go to Tibet for visit, travel and business. Take the United States for example, there have been nearly 40,000 Americans who have come to Tibet since 2015, including the minority leader of the US House of Representatives and senators. All these have fully proved that the accusations against China in the US bill are totally untenable and must not be accepted by the Chinese government and people. 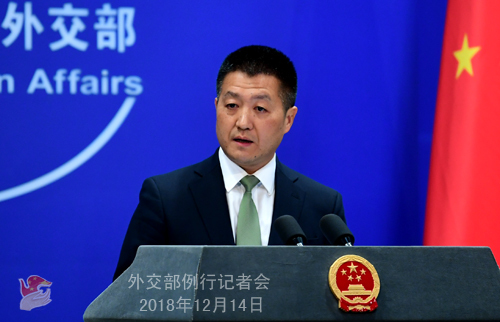 We urge the US administration to immediately take effective measures to prevent the bill from being signed into law, so as not to seriously damage China-US relations and cooperation between the two countries in important areas. 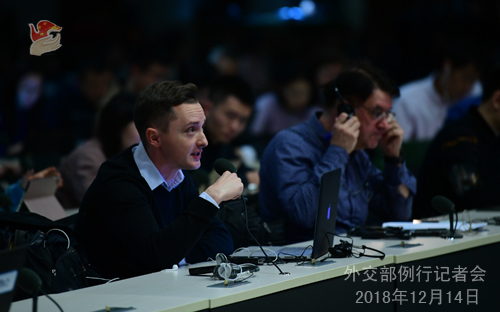 Q: Is there any update from the Chinese government regarding any communications between the Chinese and Canadian governments regarding either the two detained Canadian citizens or the Meng Wanzhou case? A: These are two matters. Regarding the wrongful detention of Ms. Meng Wanzhou, the Chinese side has been asking the Canadian government to immediately correct its mistake and release Ms. Meng Wanzhou. With regard to the two Canadian citizens you mentioned who have been taken compulsory measures in China in accordance with laws, I can tell you that China and Canada maintain normal consular communication. Q: Earlier this week, there was an incident at the Yasukuni Shrine in Tokyo involving two Hong Kong residents. Have you been in touch with the Japanese government and the individuals involved over the incident? What requests are you making? A: We have noted the relevant situation and have already expressed our concerns to the Japanese side. The Chinese side urges the Japanese side to properly handle this matter and safeguard the legal rights and interests of the persons involved. Meanwhile, we hope the Japanese side will face squarely to and reflect upon the history in the spirit of taking history as a mirror to guide the future and win back trust from its Asian neighbors and the international community with concrete actions. Q: Following the detention of the two Canadians, have they already been given consular access? A: Like I said yesterday, their legal rights and interests have been safeguarded. Q: According to reports, the Yemen peace talks in Sweden wrapped up on December 13, during which the warring parties reached agreement on ceasefire in Hodeidah, prisoner swap and other issues. What's your comment? A: Under the auspices of Special Envoy for Yemen of the UN Secretary General Martin Griffith, important progress has been made in the recent peace talks on the Yemen issue in Sweden. China welcomes that. Political negotiations represent the only way out of the Yemen issue. 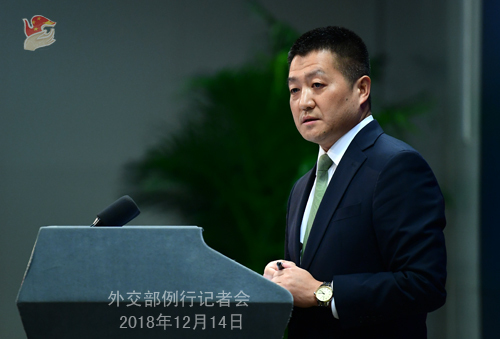 China supports all relevant parties in Yemen in reaching an inclusive solution at an early date through more negotiations on the basis of the Security Council resolution 2216, the Gulf Cooperation Council Initiative and its Implementation Mechanism, and the Outcomes of the Yemen National Dialogue Conference. We hope that all relevant parties to the Yemen issue could faithfully implement the outcomes of this round of peace talks, realize the ceasefire and improve the humanitarian situation as soon as possible, continue to accumulate mutual trust, move forward the political settlement process through dialogue and negotiation, and restore peace, stability and normal order in Yemen at an early date. China supports the UN in continuously playing a constructive role in the Yemen issue and we will also continue with our positive and constructive role in securing a political settlement of the Yemen issue. Q: I noticed that last night, there is an increased police presence outside the Embassy of Canada in Beijing. Is that because there is some concern given these calls on social media for boycotting Canadian goods and there might be some sort of increase in anti-Canada sentiment in China? A: First of all, I have not heard about the situation you said. Second, your way of connecting these dots may have some reason in it. The wrongful detention of Chinese citizen Ms. Meng Wanzhou by the Canadian government at the behest of the United States has indeed caused widespread anger among the Chinese people. Q: On December 7, the Canadian Foreign Minister said that Canada is giving consideration to a foreign investment protection agreement with Taiwan. On December 13, the economic and trade dialogue between Canada and Taiwan was held in Taipei. Analysts say that Canada is now playing "the Taiwan card" to hold the mainland in restraint. What's your comment? A: Regarding China's position on the Taiwan issue, I believe that all the countries in the world are very clear about that. If, as you said earlier, the Canadian side did try to play the "Taiwan card", then it has miscalculated the situation so much that it will only end up hurting itself. Due to scheduling reasons, the Foreign Ministry's regular press conference on December 17 (Monday) will start at 14:00 at the same venue.